Our contemporary-style service is a multimedia experience. Music is an important part of the worship service, because we believe that music communicates in ways that words cannot. We praise God with uplifting songs and hymns in a Contemporary Christian style. Services also feature inspirational short films, sing-along videos, and stunning visual images to stimulate the imagination. Welcome! 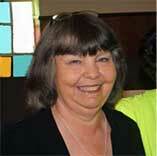 I have been the pastor for Joining Hands Mission United Methodist Church for the past seven years. This community has grown not just in numbers but ministry to the community. I am very blessed as a second career pastor who is blessed each week to share our breakfast and listen to the needs of many families in stressful times. Each week I am able to meet each attendee, many who share their lives with me. I am able to serve more time since I have retired from my full time accounting job. I have moved into the community to allow my understanding of what is needed and being more available to the church. I am also the mother of three girls, grandmother of thirteen and great grandmother of five.